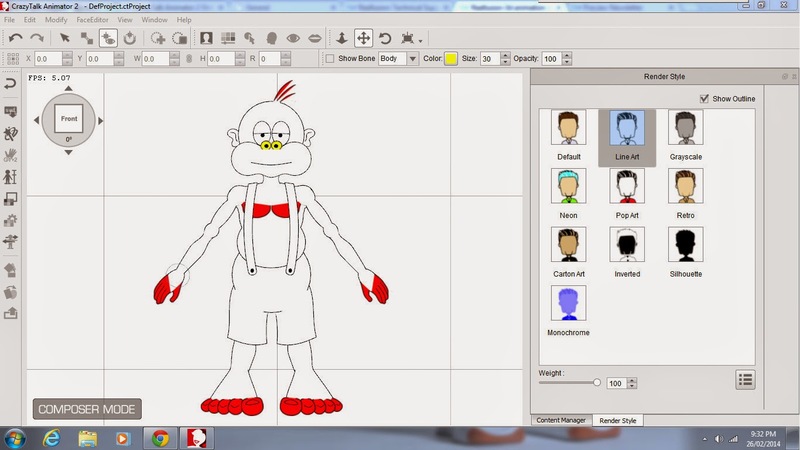 Way back in February of 2014 I began working on my very first CrazyTalk Animator 2, Multi-Dimensional character. Formerly known as the Skate Monkey, the character has since been retitled the Bored Monkey in line with a new series of skateboard graphics I'm planning to feature him on. If you'd like to know the history of the character's development you can read it in these blog posts; Part 1, Part 2 and Part 3. These posts include sample videos of the character in action. Below is the last demo video I created. By the end of February 2014 I'd hit a couple of stumbling blocks with the character that took the wind out of my sails in terms of enthusiasm for continuing to work on it. The first was an issue with character styles in CrazyTalk Animator 2. I wanted my character to be fully compatible with these but when I changed the monkey's style to line art, you can see in the image below that some body parts remained filled in with red. I contacted Reallusion's support team and discovered my use of open filled curves in DrawPlus X6 was the issue (sorry if you're not familiar with vector art terms). Turns out these are not compatible with CrazyTalk Animator 2. As a result Reallusion updated their character creation guidelines for the DrawPlus character template to make people aware that they shouldn't use fills on open curves. From my point of view, this meant I now had ten views of my character to fix all these body parts on, which was going to take days to complete. Wind in my sails severely deflated. The next difficulty was that I had been about to embark on creating all the eyes, mouth and hand movements - literally hundreds of additional images and a daunting task in its self involving two additional character templates. The thought of having to fix my character then come back and do the rest of the work... wind in my sails gone! I just shelved the whole project. Nearly a year later and with a resolve to start working full time on animations featuring my own art, it's time to resurrect this project. There's a few things I want to tweak with this character's design after seeing Gary Pye's work on his character Dan the Business Man. Namely I want my monkey to look more hand drawn with varying line thicknesses. I've never been happy with the clinical, uniformity of my vector outlines. Hopefully, because much of the work has already been done I'll be able to push through and finish the character. Watch this space. with any luck I'll have some updates to share by my next blog post.